Hubby's phone was not functioning very well these days since the button was somehow doesnt do what it should do. 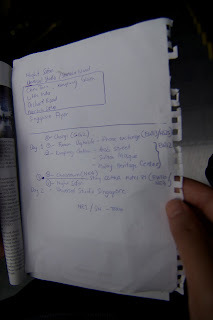 So we went to Singapore last weekend just to claim his warranty. FYI, iPhone warranty doesn't applies world wide. Mane ko beli, situlah ko claim. The trip was seriously like in Amazing Race. We are running and traveling like in the series. Chasing the flight and searching for right place at the right time. We bought Jetstar return ticket. The departure flight was at 8.40am but both us checked in 8.05am. The check-in counter supposed to close 40 minutes before boarding. Thankfully the lady at the counter being nice and allow us to check-in. We both running towards the gate without knowing our gate is change to different gate. Another scene running on the airport that morning. Luck is still on our side where people are still queuing to depart. Ahh..lega..sep bek sempat. Arrived around 10am at Changi airport and first thing on our travel list was to go to Funan where the place is like LowYat. Much proper than LowYat I must say. We went to the Apple store but too bad, we can't claim the warranty there. The customer service said that we have to go Tagore (warehouse) where we can have Hubby's iPhone to be fixed. It was 12noon and the store there closed at 1PM. We rush to find cab and it takes us almost 45minutes to reach at the place. The traffic light wasn't so nice to us that day. Every traffic that we met turns red and makes us sweats even more cause this is our main purpose coming to Singapore. Luckily the taxi driver being understanding and drive as fast as he can and luckily Hubby manage to catch the counter before it is closed. His turn was number 57 and the current person being serviced was 42. It took us almost 2hours to have our turn and I manage to get my sleep while waiting. We wait in the room where only (I think) 5 to 6 people inside where else the remaining people waiting at the reception area. Well, there's where I have my first sleep since we wake up at 5.30am and I dont know how many people heard I snore cause when I wake up, it's only both of us in the room. God knows how embarrassed I am. Hubby being nice by saying 'No one would ever know you la Sayang. This would only be the first and last time they see us and listen to your snores'. Hahaha. True that. Not long after that, Hubby's number been called and he's the second last person being serviced. It just takes about 10 minutes to claim the warranty but waiting time was so long! We are lucky enough not being the person who queue hours and having the answer 'You bought your iPhone in China so you cannot claim it here' or 'You just have to restore back to your iTunes' or 'We just change the setting and you can do it on your own'. Both Hubby and I were looking at each other and having the thought 'Why these people dont do their our Google before coming here? Dah la the service lady so bitter' Lolz. After finish our mission in Tagore, we decided to check in to the hotel and have our solat there since we have no idea where to get any surau around the area. Tagore was an industrial place and somehow it is hard to get a public transport like cab or MRT. The nearest MRT was about 2km's away and I was being so confident and said 'Ala..titiwangsa pun 2km lbeh je. Jalan jelah, skejap je' and you know what, it took us 45 minutes! Fourty freaking five! I was wearing skirts and started melecet di pehaku yg temok ni. Ingt tak jalan bnyk la for the first day. Skali, padan muka. But alhamdulillah, the weather is so nice - not too hot and it's not raining. So we were having a good 45minutes of walking (minus the uncomfortable pain in between my thigh) and viewing (more to critics) how Singapore is. Similar to Malaysia just our building much more pretty :P but to be honest, they have clean city and fully utilized pedestrian walk. I mean there always people walking and cycling next to the road. Impressed kejap. Important thing - MRT ticket and MRT map! 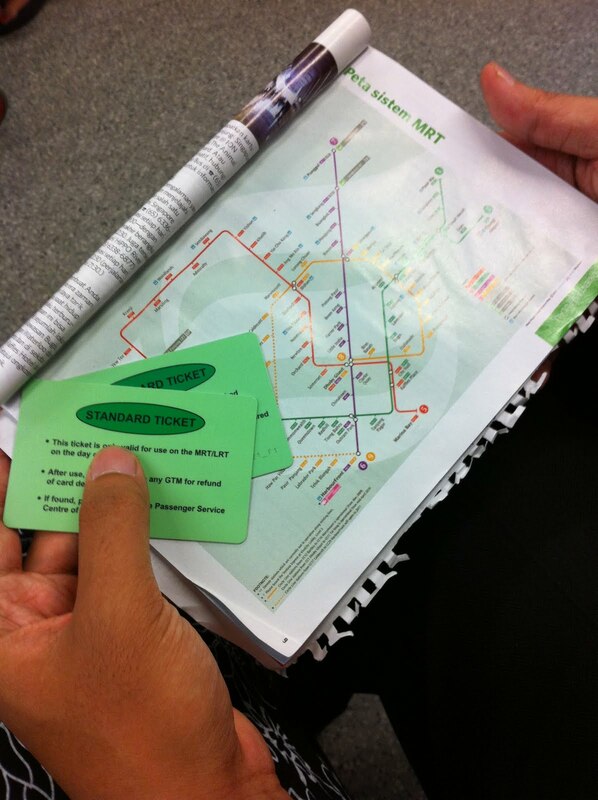 Later we reached at the nearest MRT which is Yio Chu Kang. Btwy, their single trip MRT ticket have 1 SG dolar deposit return. Funny. The first thing we saw at the MRT was 7E and quickly grab our drinks before continue to the train. Ahh..so thirsty and hungry la mase tu. Fikir nak bed, rest and eat je. Oh, by the way, we have our SIN mtrip apps on my iPhone where it stores all the maps in the phone so we can use it like Google map did without having 3G. Cool gile! and it helps a lot during our traveling days in Singapore.